I love a good pork chop, with the emphasis on “good!” Try as I have, nothing beats a pork chop grilled in the backyard on my Weber. A pork chop can be tricky. Time is essential to get in range, and an instant read thermometer is key to a perfect cooked temperature. While pork can be grilled to less than 145° F, going greater is a recipe for a tough and dry piece of meat. The lean quality of pork makes it an excellent candidate for dry-brining. 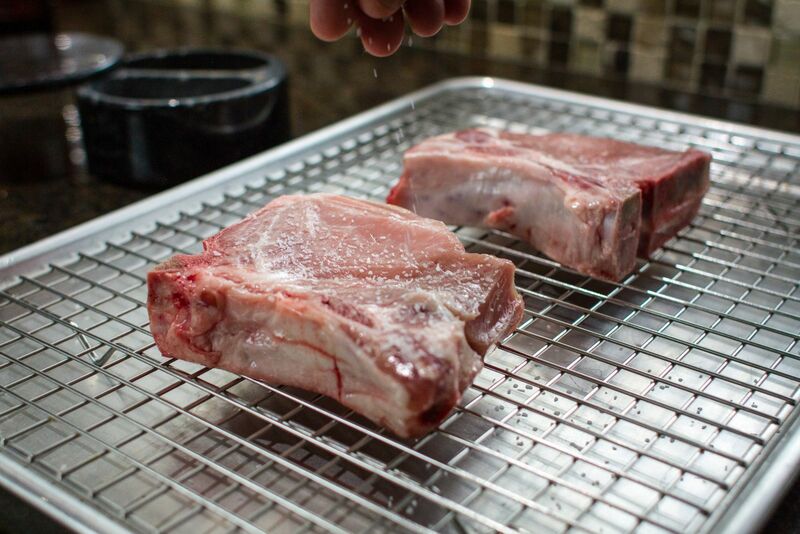 Pre-salting the pork ahead of time allows the meat to retain moisture resulting in a more flavorful and juicy chop. It takes a little bit of planning, but the result is well worth it. 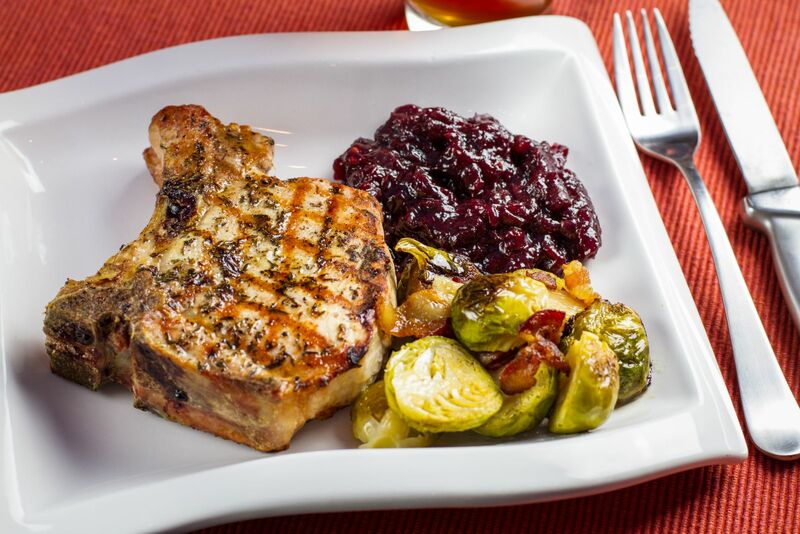 I’m also a sucker for a great sauce, and the texture of a pork chop is primed for something bold, in this case, a simple port cherry sauce. It’s no wonder my favorite pork chops are found right out my backdoor. 1. Place pork chops on a wire rack. Salt both sides and refrigerate loosely covered for at least 2 to 4 hours. 2. Before grilling, in a medium saucepan, combine the cherries, port, brown sugar, cornstarch, lemon juice, and red pepper flakes. Bring to a boil, while occasionally stirring, then reduce heat and simmer. With a spoon, be sure to burst the cherries. 3. Season the pork chops with freshly cracked black pepper. Brush with olive oil. 4. Prepare a two-zone fire and grill over direct medium heat, around 325° to 375°F. 5. For a 1-inch thick chop, grill approximately 8-10 minutes, flipping once. Grill until the internal temperature reaches 140°F with an instant-read thermometer. 6. 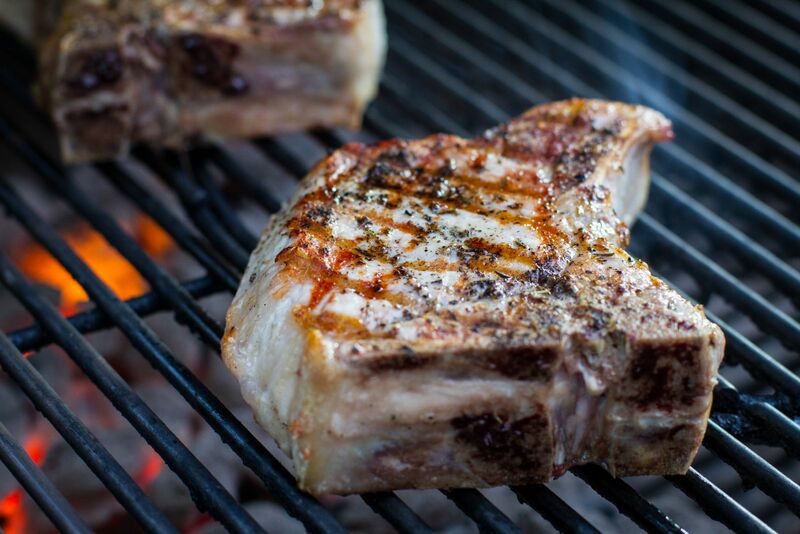 Remove from the grill, loosely tent the chops with aluminum foil, and allow to rest 5 minutes.